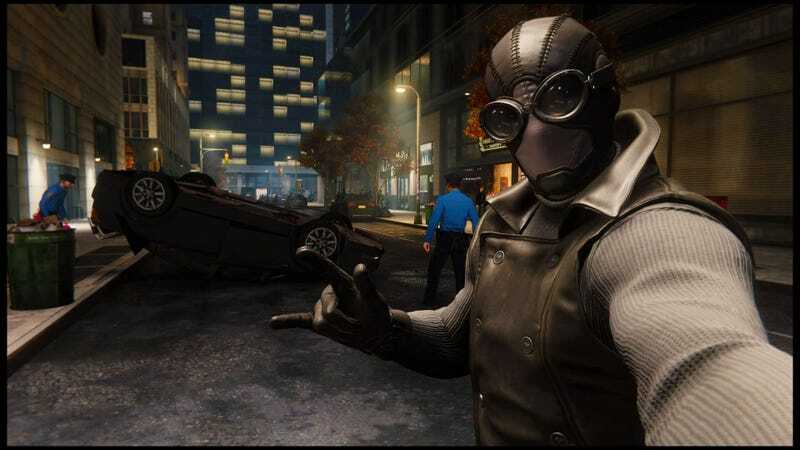 Something close to the Noir Suit from the Spider-Man video game is coming to the big screen sooner rather than later. Rumor has it the first trailer for Spider-Man: Far From Home is coming this Saturday out of Brazil Comic-Con. If that’s true, fans are soon going to learn a lot more about what Peter Parker has been up to since, well, we don’t know when. But, we do now have really good images of some of his new duds. Fresh from what we believe to be the floor at Brazil Comic-Con, Reddit has posted a nice, clear shot of what fans have dubbed either the “noir suit” or the “stealth suit.” Since this is out there in the world, it’s safe to assume this will appear in that trailer, if it is coming this weekend. Click on the image to see the full body. We’ve seen glimpses of that suit in spy photos that have made their way online, but this is our best look. And it’s certainly stealthy, though there are a lot of bells and whistles, like that belt and chest plate, that feel a little superfluous depending on exactly how stealthy Peter trying to be. Then again, we know almost nothing about this movie save for some set images, so it’s probably safe to assume it all works for the story that’s being told, which has something to do with S.H.I.E.L.D., going to Europe, and probably Mysterio. As you can tell from our top image, this suit is very similar to the Noir Suit from the PS4 video game, which in itself has its own comic book origins, which you can read about here. Basically, it’s the same as the Homecoming suit, just with darker colors. We’ve seen that on set a lot. Spider-Man: Far From Home is scheduled for release July 5, 2019, making it the first Marvel Cinematic Universe film to be released after Avengers 4. And though we think it takes place after that film, since Peter Parker is currently “dead,” we don’t know for sure.